A Conservative council leader suspended for sharing a message describing anti-Islamic activist Tommy Robinson as a "patriot" has been re-instated. Andrew Bowles, who leads Swale Council, was disciplined after appearing to endorse a claim Mr Robinson's Facebook ban was a "disgraceful injustice". He has apologised for any offence caused and agreed to attend training on the better use of social media. Labour said the Tories were in denial about Islamophobia in their ranks. 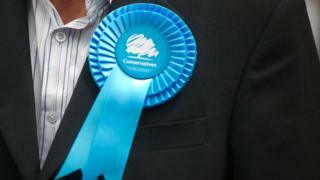 The party has come under fire in recent weeks for its handling of allegations of anti-Muslim prejudice. Former Conservative chairwoman Baroness Warsi has accused party officials of failing to deal with complaints properly and ignoring her warnings about the scale of the problem. The current chairman Brandon Lewis has insisted swift action has been taken when complaints are made although the party has declined to say how many cases are currently being investigated. Mr Bowles, who has led Swale Borough Council in Kent for 16 years, was suspended after appearing to back a message criticising Facebook's decision to ban the former English Defence leader from its pages. The message contained a doctored image of the movie The Patriot featuring Mr Robinson's face superimposed on the body of the main character, played in the film by Mel Gibson. It said Mr Robinson's Facebook ban was due to him being "racist to Muslims", arguing that this was a "disgraceful injustice" and "this corruptness needs to stop". At the time of his suspension, Mr Bowles insisted he had not meant to endorse Mr Robinson's "racist and intolerant views" which he found abhorrent. Instead, he said he had wanted to make the point that "silencing" the campaigner risked turning him into a martyr. Speaking on Monday, he again apologised for any offence caused by his tweet and disclosed he had received an email from the Mr Lewis' office reinstating his party membership. The BBC's political correspondent Iain Watson said no reason had been given by the party for the decision. A Conservative Party spokeswoman said its complaints process was rightly confidential, so as to "protect the anonymity of potential complainants, so they can come forward in confidence". "Selective cases do not provide a complete picture of how complaints are dealt with," she said. Shadow equalities minister Naz Shah expressed concern about the speed with which Mr Bowles had had his suspension lifted, suggesting it showed the Conservatives were not taking the issue seriously. "They can start by adopting the All-Party Parliamentary Group for British Muslims' definition of Islamophobia, as Labour has done," she said. "But what the Tories really need is an independent inquiry to root out this and other forms of racism within their ranks." Facebook removed Mr Robinson's official page and Instagram profile last month, saying its contents violated its policies on hate speech and the social network's community standards.